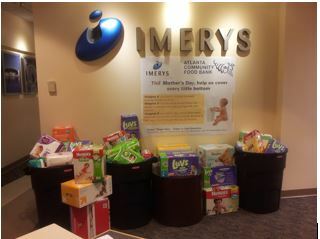 Roswell, Ga. – Over the past month, Imerys has been raising awareness about the need for clean diapers in a Mother’s Day themed diaper drive at their US headquarters in Roswell, Ga. Imerys has collected over $1,222 and 2,618 diapers in donations which will be given to the Atlanta Community Food Bank. Huggies® conducted a study in 2010 and found that almost 6 million children live in poor or low-income homes in the United States and about 1 in 3 mothers experience diaper need. Diaper need is defined as the struggle to provide babies with an essential need – diapers. Some mothers face having to clean out and reuse soiled diapers or have to choose between diapers and other basic needs like food. 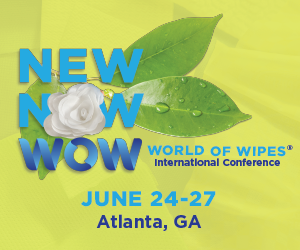 «With Imerys’ position as a raw-materials supplier to the diaper industry, this need really hit close to home for us. It’s nice to be able to give back locally within an industry we supply». If you would like to learn more about Imerys, please visit www.imerys.com. To see how you can help the Atlanta Community Food Bank with diaper need this mother’s day, visit www.acfb.org. Whether mineral components, functional additives, process enablers or finished products, Imerys’ solutions contribute to the quality of a great number of applications in consumer goods, industrial equipment or construction. Combining expertise, creativity and attentiveness to customers’ needs, the Group’s international teams constantly identify new applications and develop high value-added solutions under a determined approach to responsible development.